Food Corporation of India (FCI) Recruitment 2019: The Food Corporation of India has recently closed the application process for the recruitment of candidates to Junior Engineer posts and next stage is the recruitment examination of JE which will be held soon. Check the details of FCI JE Exam 2019 given below. Food Corporation of India (FCI) Recruitment 2019: The FCI Recruitment 2019 advertisement for Junior Engineer posts had been published by the Food Corporation of India on its official website and employment news on 01/2019. According to the notification, applications were invited for the posts of Junior Engineers through the prescribed format from February 28, 2019, till March 30, 2019. 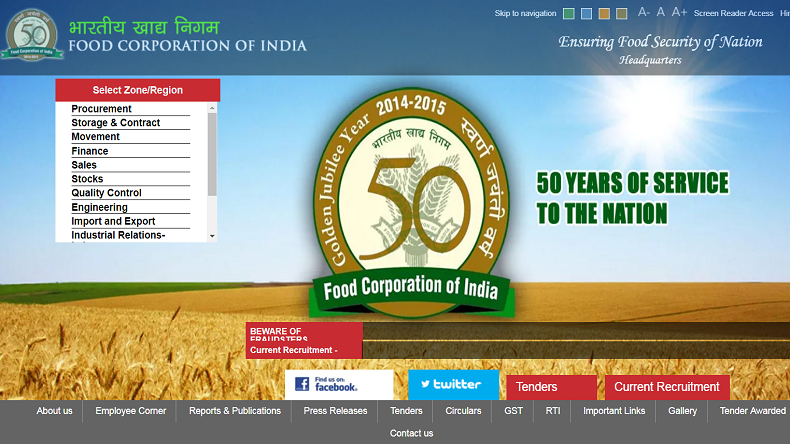 The official website of FCI is – fci.gov.in. According to reports on a website, the FCI JE Exam 2019 will be tentatively held in the month of April/ May this year. Candidates who have submitted their applications for the upcoming FCI JE recruitment exam 2019 are advised to keep an eye on the official website of the FCI – i.e www.fci.gov.in. Also, reports say that there are more than 4000 vacant positions in the departments of FCI for which, the authority is conducting this recruitment drive. Candidates can go through the details of the vacancies by clicking on this direct link: http://recruitmentfci.in/.